According to a new market report published by Transparency Market Research “Freezer and Beverage & Wine Coolers Market - SEA Industry Analysis, Size, Share, Growth, Trends and Forecast 2014 - 2022” the SEA market for freezers and beverage & wine coolers, in terms of revenue, was valued at US$ 1,011.0 Mn in 2014 and is forecast to grow at a CAGR of 6.4% during the period 2014 to 2022. Growth in demand for packaged foods and non-alcoholic drinks and high economic growth with increase in establishments such as hotels, cafés and food chains are key factors driving the growth of SEA freezer and beverage & wine coolers market. In addition, growth in number of modern grocery retailers such as hypermarkets, supermarkets and superstores apart from independent outlets in the region is further expected to drive the growth of this market over the forecast period. The SEA freezer and beverage & wine coolers market was dominated by the freezer category with a market share of around 58% in 2014. Food and packaged food, dairy, confectionary and ice-cream industries in SEA are driving the freezer market. Wine coolers market is forecast to grow at a significant rate during the forecast period 2014 to 2022. Food & beverages and tourism industries are expected to drive the demand for wine coolers in the SEA region. Ice cream freezers, chest freezers and upright freezers are three different types of freezers analyzed in the report. The SEA freezers market was dominated by the ice-cream freezers with a market share of around 42% in 2014. The demand for chest freezers from convenient stores and traditional retailers is expected to grow during the forecast period. The segment is projected to grow at fastest CAGR at 7.0% in the region throughout the forecast period due to strong demand for packaged foods, confectionery products and canned food items. By capacity range, 300 to 500 litres freezer segment with approximately 32% share in the overall SEA freezer market in terms of revenue was the largest among all freezer types. Most of the FMCG manufacturers/establishments, food chains and ice-cream chain outlets enter into agreement with freezer manufacturers. These FMCG manufacturers provide assistance by providing freezers to the local convenience stores and also aid hypermarkets by constituting a mini outlet within the premises of the hypermarket. By country, Indonesia was one of the largest contributors to the SEA freezers and beverage & wine coolers market in terms of revenue in 2014 on account of large demand from rapidly growing middle class population. The stable economy has led to rising disposable incomes, which have increased the purchasing power of consumers at foodservice outlets. Vietnam held the second largest revenue share of the overall SEA freezers and beverage & wine coolers market in 2014. Beverage coolers market in Thailand is expected to achieve significant growth during the forecast period from 2014 to 2022. Strong GDP, economic growth rate and rapid urbanization and advent of BPO and KPO industry across the SEA region are expected to primarily drive the growth of freezer & beverage and wine cooler market in SEA. Opportunities from other countries including Philippines and Malaysia are expected to further drive the growth of SEA freezer & beverage and wine coolers market during the forecast period from 2014 to 2022. Leading companies operating in SEA region in the freezer and beverage coolers market include AB Electrolux, Concepcion Industrial Corporation (CIC), Frigoglass SA, General Electric Corporation, Hoshizaki Singapore Pte Ltd., Midea Group, Sharp Electronics Co. Ltd. and South East Asia Hamico Export JSC. Also few of the domestic manufacturers include PT. Royal Sutan Agung (Indonesia), The Cool Company (Thailand), PT. Indotara Persada (Indonesia), and SAMEMAX Refrigeration Sdn. Bhd. (Malaysia) among others. 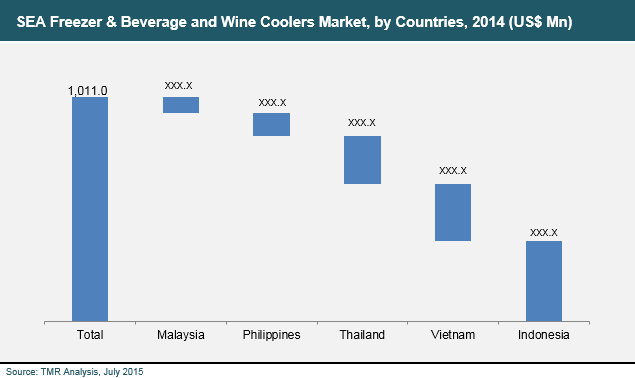 Indonesia led the SEA Freezer and beverage & wine coolers market in 2014 with the share of around 36% in 2014 of the overall SEA freezer and beverage & wine coolers market. The reason behind this being more number of consumers are demanding and purchasing packaged foods, ready-meals, frozen foods, sauces and dressings. The market in Thailand is expected to grow at fastest CAGR in both the categories namely; freezers and beverage & wine coolers market during the forecast period. The key manufacturers in SEA freezer and beverage & wine coolers market are AB Electrolux, Concepcion Industrial Corporation (CIC), Frigoglass SA, General Electric Corporation, Hoshizaki Singapore Pte Ltd., Midea Group, Sharp Electronics Co. Ltd., South East Asia Hamico Export JSC and The Cool Company among others.